Halloween themed birthday party success! 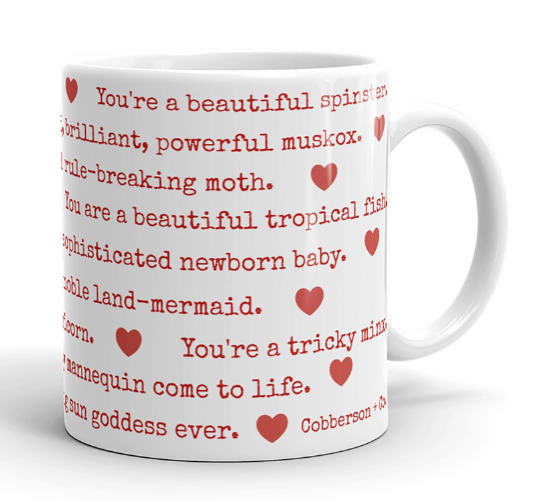 | Cobberson + Co.
Halloween themed birthday party success! I know we’ve all seen that hilarious Pinterest fails meme (the one with the hedgehog cake wearing dentures cracks me up EVERY SINGLE TIME), but I found two foolproof dessert pins for your Halloween party. My younger son requested a Halloween themed birthday party this year, which if you can convince your kid to do this, DO IT. Seriously. 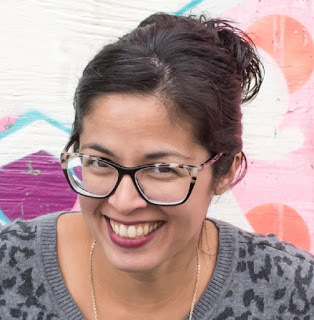 It was the easiest party ever to find cute and easy (and cheap!) snacks/ plates/ etc. Every year, when I make birthday cakes for the guys, I try to make something that will make their face light up when I see it. It gets me super excited. 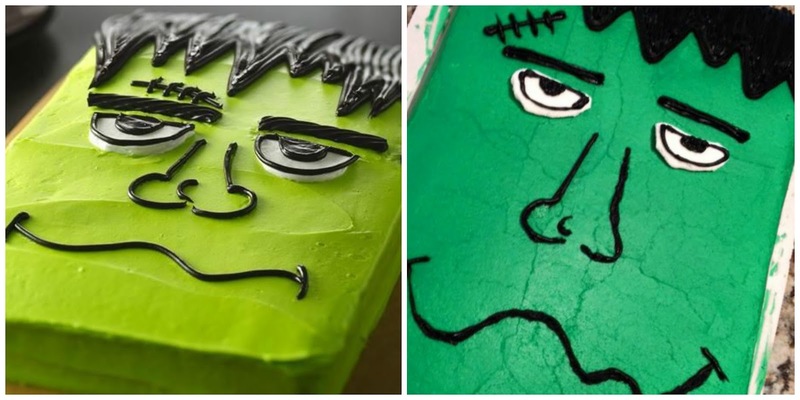 So this year, when my little one said he wanted his cake to have a ghost and Frankenstein, I was a little stumped on how to combine these two things on one cake in an interesting way. First I thought maybe I’ll make a little Halloween gingerbread house and stick that on top of the cake and a lollipop ghost. But Frank? Kinda threw a wrench into things. I’m no Cake Boss, so I wasn’t exactly going to pull out my industrial cake tools and carve up an edible Frankenstein. Instead I did the obvious thing. I turned to Pinterest. I found this cake idea from Betty Crocker and liked the look of it. I needed a big sheet cake, so I ordered just a plain solid green cake from Costco. PS, wow, do they try to talk you out of ordering a cake like this, presumably because if you don’t decorate it, it looks really silly and they don’t want you to tell everyone it’s a Costco cake. The Betty Crocker cake uses licorice to add the black detailing, but I’m not a licorice fan at all, so I used two squeeze tubes of Wilton black icing (which was half the price at Target, btw). The star tip was perfect for the hair, and the line tip was ok but not ideal for the rest of the face. There were a LOT of adjustments using toothpicks to get clean lines. I also picked up a tube of the black gel, but it was way too runny for me to draw the face on, so I didn’t use it. 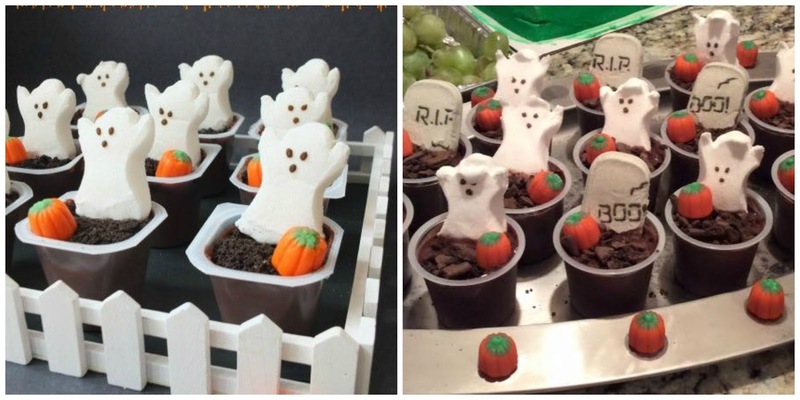 Since I also needed some kind of ghost dessert, I found this super cute graveyard pudding cup idea from Party Pinching that was a big hit. There’s zero work needed – you just buy Peeps in ghost or tombstone shapes, crumble up some chocolate cookies, stick both in the cup with a candy corn pumpkin, and you’re done. Super cute, fast, and the kids loved them. Most importantly, my son thought both were awesome and he had a great time at his party. Pinterest win! What kind of party ideas have you found on Pinterest? How did they turn out?